ENGINEERING. PRACTICE. POLICY. 45 October/November 2018 unmanned systems inside The batteries for Impossible Aerospace's US-1 drone are integrated into its structure. The US-1 is rated to support up to 2.9 lbs. of payload. This may include opti- cal cameras such as the Sony R10C and Sony QX30C, thermal cameras such as the FLIR Duo Pro R, survey cameras such as the MAPIR Survey3 and multi- spectral sensors such as the Slantrange 3p or Micasense RedEdge-M, the com- pany said. With its rated payload, it has a flight time of up to 78 minutes. 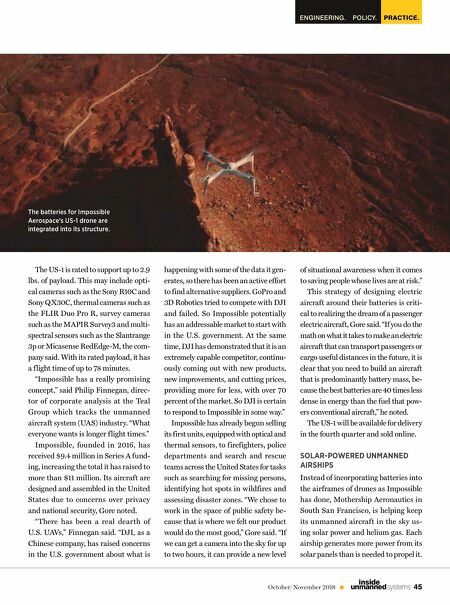 "Impossible has a really promising concept," said Philip Finnegan, direc- tor of corporate analysis at the Teal Group which tracks the unmanned aircraft system (UAS) industry. "What everyone wants is longer f light times." Impossible, founded in 2016, has received $9.4 million in Series A fund- ing, increasing the total it has raised to more than $11 million. Its aircraft are designed and assembled in the United States due to concerns over privacy and national security, Gore noted. "There has been a real dearth of U.S. UAVs," Finnegan said. "DJI, as a Chinese company, has raised concerns in the U.S. government about what is happening with some of the data it gen- erates, so there has been an active effort to find alternative suppliers. GoPro and 3D Robotics tried to compete with DJI and failed. So Impossible potentially has an addressable market to start with in the U.S. government. At the same time, DJI has demonstrated that it is an extremely capable competitor, continu- ously coming out with new products, new improvements, and cutting prices, providing more for less, with over 70 percent of the market. So DJI is certain to respond to Impossible in some way." Impossible has already begun selling its first units, equipped with optical and thermal sensors, to firefighters, police departments and search and rescue teams across the United States for tasks such as searching for missing persons, identifying hot spots in wildfires and assessing disaster zones. "We chose to work in the space of public safety be- cause that is where we felt our product would do the most good," Gore said. "If we can get a camera into the sky for up to two hours, it can provide a new level of situational awareness when it comes to saving people whose lives are at risk." 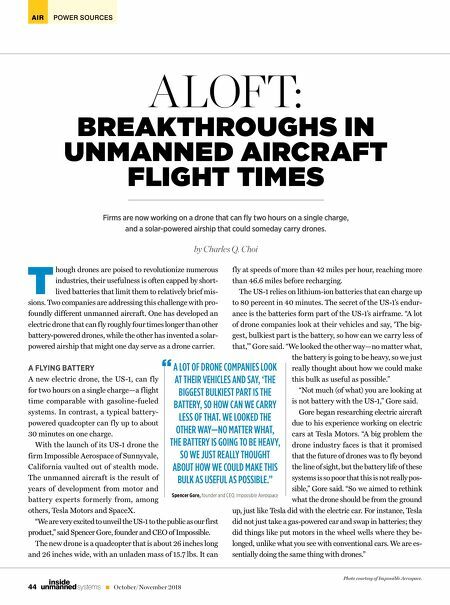 This strategy of designing electric aircraft around their batteries is criti- cal to realizing the dream of a passenger electric aircraft, Gore said. "If you do the math on what it takes to make an electric aircraft that can transport passengers or cargo useful distances in the future, it is clear that you need to build an aircraft that is predominantly battery mass, be- cause the best batteries are 40 times less dense in energy than the fuel that pow- ers conventional aircraft," he noted. The US-1 will be available for delivery in the fourth quarter and sold online. SOLAR-POWERED UNMANNED AIRSHIPS Instead of incorporating batteries into the airframes of drones as Impossible has done, Mothership Aeronautics in South San Francisco, is helping keep its unmanned aircraft in the sky us- ing solar power and helium gas. Each airship generates more power from its solar panels than is needed to propel it.